Looking at the picture, you can’t escape, but be amazed at the wonder of the fireworks. 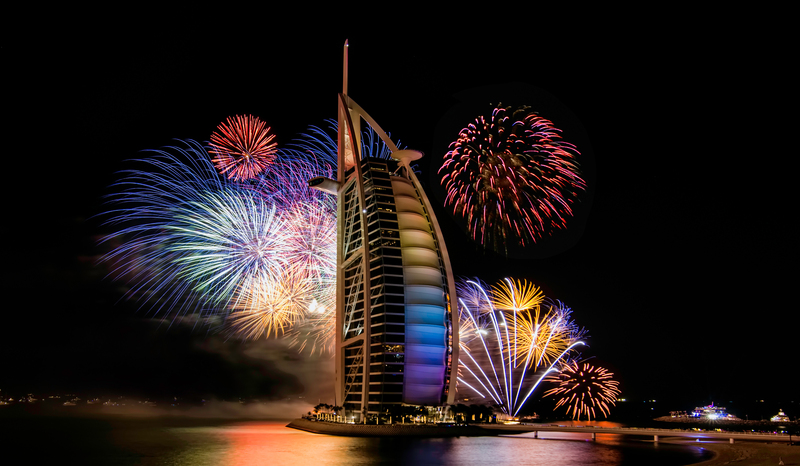 Oh.. sure, Fireworks are lit all around the world at the dawn of a new year; but Dubai does it with a bit more flare. Frankly it is a sight that many wish that they could see. If you’ve seen one firework’s show, you’ve seen them all. That indeed may be true, but that is where it is up to the event organizers to make it bigger and better than before. 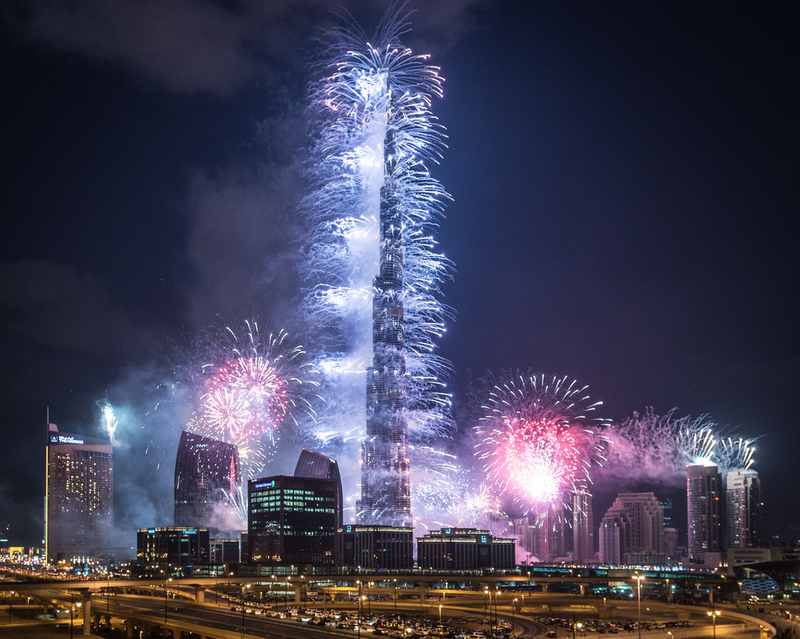 I recall last year, there was a huge ‘fail’ of some sort when a neighboring building to the Burj Khalifa caught on fire. On the whole, New Year is a night long party that never stops till the light of dawn. For most people, it is a time that they are dancing, laughing and sharing in the first New Year kiss with a loved one. For me the most remarkable part of a New Year is not to enter it at all an intoxicated mess. Well, I’m never been invited to a New Year’s celebration party so there. For me, it is the quite restraint of watching the sunrise and seeing light of dawn. If it sounds simple and sweet, that is because it is. While not as exciting as the party I could be attending, it is a peaceful time of enjoying the simple moments just before the world settles into its daily routine once again. Let us be honest, we humans are the only ones who celebrate the passing and dawning of a year. There is no other species on this planet that does it. While I have explained it to them a number of times, my cats do not understand the concept of New Year. For them, they live day to day. Their worry is not if they will see another day. Their worry is whether I’m going to give them their dinner or not. And this neatly bring me to the thought. We often hear the expression of a New Year’s resolution – a goal for the coming year. Most often the case is that we make the resolution and then break it. Those who do not, but are disciplined to hold on, will enjoy real success. So is the idea of a resolution worthwhile or not? Truthfully, it all depends on the person. As I watched the dawning light from the roof of my home, it was a time of reflection. The past year had it ups and downs. It is sure that 2017 will present its own challenges in time. But the warmth of the sun’s rays and the dawning light, reminds me that no matter what lies in the year passed, there is a new day, a new year and a new beginning waiting for me. As I made my way down from the roof, I could hear the hustle and sounds of the streets – people on their way home to rest from the night of partying and dancing, weary. New Year’s day is going to be full of hangovers and sleeping. In my heart and mind I wished the world… Happy 2017. Your future hasn’t been written yet, no one’s has. Your future is whatever you make it, so make it a good one.